Exterior Industrial Metal Restaurant Bar Height Chair with Aluminum Frame - 14 lbs. This Exterior Industrial metal bar height chair features a sheen brushed aluminum finish. Perfect for pizzerias, clubs, and cafes that theme their establishment with the brilliance of metal. This restaurant chair makes a modern appearance in dining areas both indoors and out. Includes a comfortable 12in high footrest. 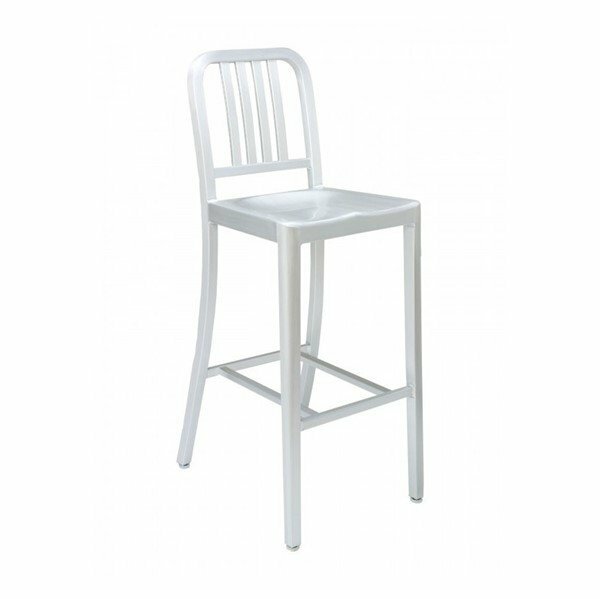 Our industrial metal restaurant bar chairs are built to last and come with a 2-year commercial warranty. • Dimension: W 15.5" x D 15" x H 33"